Thy nativity, O Virgin, has proclaimed joy to the whole Universe! The Sun of Righteousness, Christ our God, has shone from Thee, O Theotokos! By annulling the curse, he bestowed a blessing. By destroying death, He has granted us eternal life. 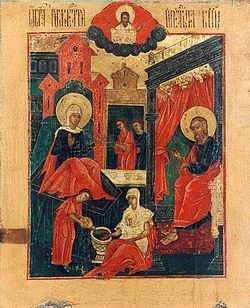 By thy nativity, O Most Pure Virgin, Joachim and Anna are freed from barrenness; Adam and Eve from the corruption of death. And we, Thy people, freed from the guilt of sin, celebrate and sing to Thee: The barren woman gives birth to the Theotokos, the nourisher of our life! Since you were righteous under the Law of Grace, O Joachim and Anna, ye gave birth to the God-given infant for our sake. Therefore, the divine Church radiantly keeps feast today, joyfully celebrating your honorable memory and giving glory to God who has raised up a horn of salvation from the house of David. Anna is now no longer barren and nourishes the All-pure One! She rejoices and calls us all to sing a hymn of praise to Christ, Who from her womb gave mankind the only ever Virgin Mother. No Adult Education Class this week. They will resume again the following week, September 19th. On September 9th we remember three saints of the Church who experienced great anguish in their lives, for different reasons. But the three also received the compassion, and comfort, that God gives. 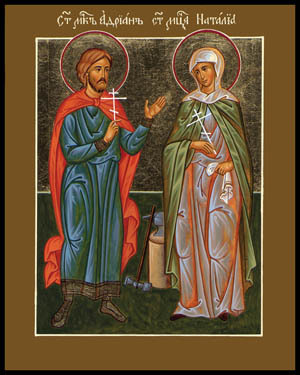 Joachim and Anna were, of course, the parents of Mary the Mother of God. Joachim was descended from King David, and Anna was the daughter of a priest. They were devout, and offered much of their income to the Temple and for the relief of the poor. But before their child’s birth, which happened late in their lives, they lived through long, lonely years of being without any children. This was not only a source of sorrow, but also of humiliation and rejection. 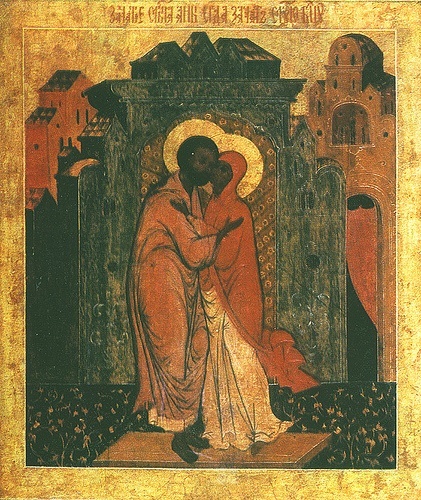 One time when they had traveled to Jerusalem to offer sacrifice in the Temple, the high priest said haughtily to Joachim, “You are unworthy to offer sacrifice with your childless hands.” Others pushed Joachim aside, and he and Anna were forced to leave the Temple and make the journey home in deep sadness. So God’s compassion, answering their fervent prayers with the birth of Mary, was especially sweet to this couple. On this day we also remember the Blessed Nicetas, called “Man of God” and also “the Hidden.” This latter name refers to his spiritual efforts, which were extraordinary but unseen and unknown by those around him. Even though he lived in the busy city of Constantinople and was surrounded by people all day, he found time for intense prayer and secret good works that brought him very close to God. Among the blessings he received during his holy life, Nicetas was once able to ease another man’s anguish and call down God’s compassion on him. This other man, a deacon named Sozon, had quarreled with a priest. They never resolved their argument, and the priest died. Sozon was grief-stricken at having let the rift continue until it was too late. Sozon’s guilty conscience led him, eventually, to Nicetas, who was able to call the priest back from the dead so that he and Sozon could be reconciled. The miracle took place at night, in the church of the Blachernae Mother of God in Constantinople. After Sozon and the priest embraced each other, Nicetas disappeared from his sight; once again he became “Nicetas the Hidden.” For the rest of his life, Sozon was free of the anguish of an unresolved quarrel.